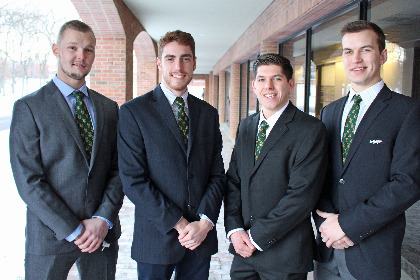 Another UVM School of Business case competition team comprising of – Alex Farrell, Andrew Root, Ken Wenner, and Jack Farrington, just returned from the Network of International Business Schools (NIBS) Case Competition in Ottawa, ON. To be invited to compete in Ottawa was no mean feat. Among a large international field, we were one of 16 schools who qualified for the competition, and while we did not win the competition, the students represented UVM in fine fashion against an elite group of business schools from North America, Central America, South America, Asia and Europe. And, as is always the case, it was a tremendous learning experience for them. Congratulations Alex, Andrew, Ken and Jack who put in a great deal of time and effort on behalf of the school.